Once you define your customer experience strategy and begin the journey down it, you'll likely find a tipping point where people, data, technology and processes start to sync, and the benefits of the hard work become clear for employees and the customers who are the true beneficiaries of a well-executed plan. Customer experience is clearly a key focus area for the majority of executives across a broad swath of industries, regions and company sizes. This probably isn’t a surprise to anyone reading this article – after all, research shows that nearly 9 out of 10 customers say they’ve left a company, switching due to poor customer experience. And although over 90 percent of senior executives state that customer experience is one of their company’s top priorities in the next few years, 30 percent of businesses don’t have a coherent definition for customer experience management across their organizations, much less a plan to execute on it. McorpCX has worked with several companies – including a handful of Fortune 100 orgs, as well as mid-market leaders – that aren’t entirely sure where to start. 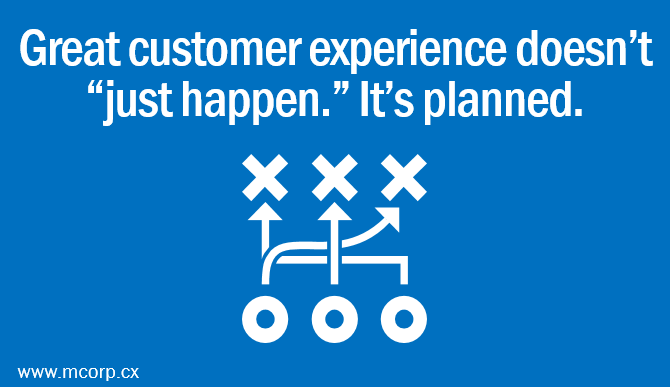 This is where customer experience strategy comes into play. A recent Aberdeen Group report titled “Customer Experience Strategy: Get It Right To Drive Success,” looks across the key activities customer experience leaders undertake to define and execute successful strategies. Change company culture to be more customer centric: Weaving culture into CX activities is key, in no small part due to the fact that to accomplish this you’ll need to determine what customer centricity means to you, then communicate to all across the org. Align brand and CX strategies: Recognizing that your brand sets very real expectations of what your customers can expect, it’s crucial to crisply align your brand and CX strategies to ensure you’re organized to keep the promises you’re making. Assign a dedicated customer experience executive: Getting organizational buy-in is a significant challenge, and crucial to the success of your efforts. The right executive will lead, influence and educate, communicating the vision and bringing the broader organization along. Formally align business and CX strategies: Just as your brand and CX strategies align, they both need to ladder back to business strategy. For example, if you compete on innovation, this leads to a different posture for, and expectations of, CX than if you compete on value, or customer intimacy. Your customer experience strategy needs to take many forms, accomplish several things at once, and balance the sometimes-in-opposition requirements of being specific enough to be actioniable, and crisp enough to be easily understood. The most effective CX strategies describe how you want customers to feel, the experience you wish to deliver and who those customers are. It also needs to describe how you will direct what your people do and how they will do it, and provide guidance for embedding the strategy into your organization. The hard truth is that there is no universal customer experience strategy, any more than there is a single brand or business strategy that works for all. Unsurprisingly, it needs to reflect your unique business, brand, and vision for the future. Aligning these things in ways that inform, guide and inspire your people and provide a clear path forward is both a challenge and an opportunity. For whatever it’s worth, as much work as defining and socializing your customer experience strategy can be, the rewards radically outweigh the efforts. The path to experience-based differentiation is a long one, to be sure. But it’s both tangible and definable. And once you define that path and begin the journey down it, you – like many of the companies we work with – will likely find a tipping point where everything seems to start ‘going right’ as people, data, technology and processes start to sync, and the benefits of this hard work become clear to all – for those employees inside your organization, as well as the customers who are the true beneficiaries of a well-executed plan.